PC users are choosing high-speed SSDs for better computing performance and reliability. 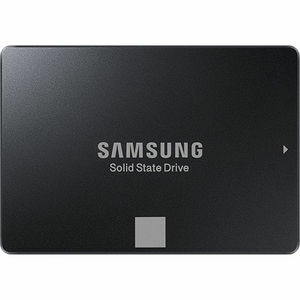 The Samsung 750 EVO SSD, with a SATA 6 Gb/s interface, is an outstanding high-performance choice for an enhanced everyday computing experience. With sequential read and write speeds up to 540/520 MB/s and random read and write speeds up to 97,000/88,000 IOPS, you will find yourself handling multitasking faster than before. The sequential write performance is measured under the TurboWrite mode. The random read and write speeds are measured on the 250 GB capacity model in 4K QD32. The flash-based 750 EVO provides superior resistance against shock and vibration for computing on the go. It also ensures 35 Total Bytes Written (TBW) for the 120 GB model and 70 TBW for the 250 GB model or up to 3 years. TBW or 3 years, whichever comes first. The 750 EVO comes with software to help entry-level users easily install and manage their SSDs. Samsung Data Migration software provides a powerful custom-cloning feature that ensures migration work even when the source data is greater than the SSD capacity. And Magician software simplifies SSD management, enabling even novices to maximise the performance and lifetime of the SSDs.